The men's Chocorua Trail Waterproof Hiking Boot by Timberland is built to last. 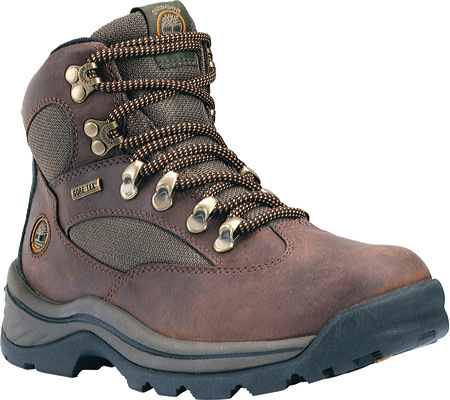 This hiking boot features durable waterproof leather uppers with a GORE-TEX membrane for extra protection. The Chocorua provides lace up closure that allows for a sturdy and adjustable fit and a round toe bumper for toe protection. This Timberland boot comforts the foot with each step as it offers an EVA dual density footbed, a padded collar, and gusseted tongue for next-to-skin comfort. The outsole of this Timberland Waterproof Hiking Boot is equipped with rubber and a lugged pattern for slip-resistance and traction on wet and dry surfaces. B.S.F.P. motion efficiency system rubber lug outsole. A built-in Gore-Tex membrane waterproofs this rugged hiking boot made with a padded collar and tongue, a flexible nylon shank, an EVA-cushioned footbed and a lugged sole. Style Name: Timberland Chocorua Trail Gore-Tex Waterproof Hiking Boot (Men). Style Number: 5387050. Available in stores. Timberland Chocorua Trail Mid WP Boot - Men's -- Free 2-day Shipping On $50+ Orders!